How is the “BITAR” different from the official ITAR available for free on the Internet? The Annotated ITAR, more popularly known as “Bartlett’s Annotated ITAR (BITAR) (5 Mar 2019 edition)” is the only version of the International Traffic in Arms Regulations (22 CFR 120-130), and fully updated with the latest amendments. The BITAR contains the full text of the International Traffic in Arms Regulations, 22 C.F.R. §§ 120-130, with features added by the author, including a Table of Contents, footnotes, section histories, appendixes containing government guidance, user aides, and an Index. BITARs are sold as soft copies in Microsoft Word, which are emailed to subscribers every time the regulations are amended, plus occasional updates to add footnotes, cases, agency guidance, and Index entries. The latest ITAR amendment is of 4 Oct 2018: 83 FR 50003-50007: Regulatory Reform Revisions to the International Traffic in Arms Regulations. Hence, the best way to ensure you have an up-to-date copy of the ITAR is buying this annual subscription to the BITAR. 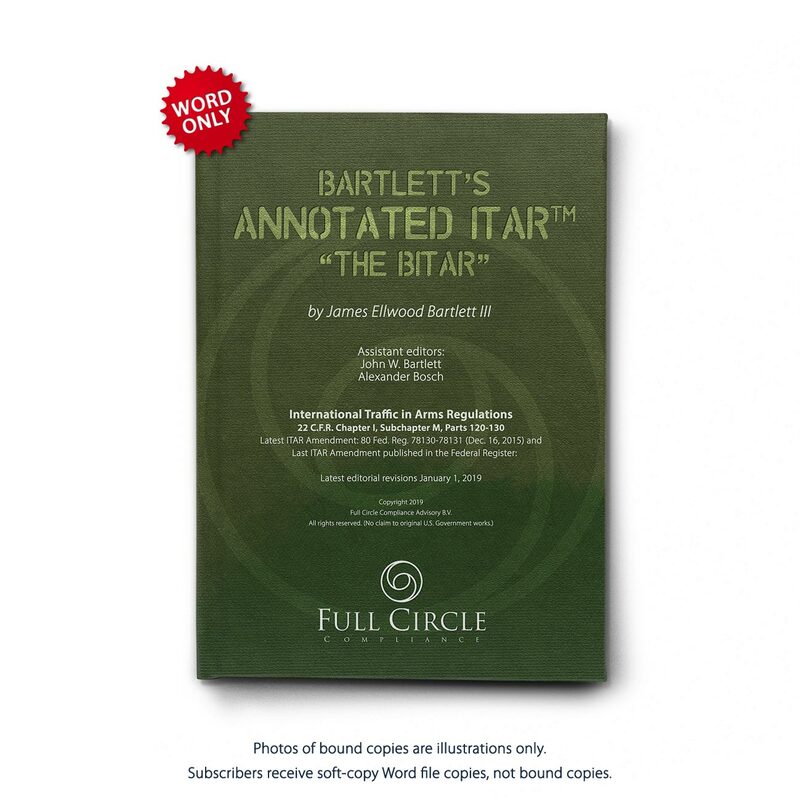 We do not sell bound copies of the BITAR, but subscribers who prefer a hard copy may print a copy themselves for inserting in loose-leaf binders or contact FCC for special prices if you would like to receive loose-leaf copies. Please enable cookies in your internet settings when going through the ordering process. Otherwise, you will not be able to make a purchase as the system cannot track the purchase process. Footnotes to errors in the official text of the ITAR. History of amendments and effective dates. Footnote 2: Amended by 79 FR 8082 (Feb. 11, 2014), effective Feb. 11, 2014. Footnote 8: Practice tip: Knowledge of ineligibility may be assumed if party’s name is posted on the System for Award Management website’s Excluded Parties List System (EPLS), an electronic, web-based system accessible at https://explore.data.gov/Information-and-Communications/Excluded-Parties-List-System-EPLS-/bxfh-jivs (last viewed Dec. 7, 2014), that identifies those parties excluded from receiving federal contracts, certain subcontracts, and certain types of federal financial and non-financial assistance and benefits. The Dep’t of Commerce has a denied party search tool for the consolidated screening list currently available on export.gov. In this first step, the search tool is a simple search companies can use from the link on export.gov. The tool combines nine export screening lists of Commerce, State and Treasury including: Denied Persons List, Entity List, Foreign Sanctions Evaders, ITAR Debarred, Palestinian Legislative Council List, Sectoral Sanctions Identifications List, Specially Designated Nationals and Unverified List. There is also an API available on developer.trade.gov for companies who wish to create their own in-house search from the consolidated list maintained on export.gov. ITA maintains the website and the consolidated lists are updated every day at midnight. Agency enforcement requirements imposed upon certain companies through consent agreements that should be followed by all companies. (6) The Respondent acknowledges and accepts that . . .
(b) the furnishing of defense services to foreign persons – regardless of whether the underlying defense article(s) is of U.S. or foreign origin – is appropriately subject to the Department’s control under the ITAR, even when no technical data is involved (e.g., all the information relied upon in furnishing defense services to a foreign government or foreign person is in the public domain); . . .
See generally Alan G. Kashdan & Andres A. Castrillon, The Broad Scope Of ITAR-Controlled ‘Defense Services’-Lessons Learned From The Analytical Methods Case, 6 Int’l Gov’t Contractor 53, July 2009. (examining the unauthorized export of defense services in the DDTC settlement with Analytical Methods, Inc., and when TAAs may be required for providing defense services to foreign persons using dual-use products and technologies—even if no export of U.S.-origin, ITAR-controlled products or technology is involved; and the “creation” of defense articles when non-defense items are modified for a military purpose).as dual-use can be used to provide an ITAR regulated defense service and can become an ITAR regulated defense article when adapted or modified for a military application; . . . .
(7) Respondent further acknowledges . . . .
(e) that software designated as dual-use can be used to provide an ITAR regulated defense service and can become an ITAR regulated defense article when adapted or modified for a military application; . . .
See generally Alan G. Kashdan & Andres A. Castrillon, The Broad Scope Of ITAR-Controlled ‘Defense Services’-Lessons Learned From The Analytical Methods Case, 6 Int’l Gov’t Contractor 53, July 2009. (examining the unauthorized export of defense services in the DDTC settlement with Analytical Methods, Inc., and when TAAs may be required for providing defense services to foreign persons using dual-use products and technologies—even if no export of U.S.-origin, ITAR-controlled products or technology is involved; and the “creation” of defense articles when non-defense items are modified for a military purpose). Bartlett’s Annotated ITAR (BITAR) is copyrighted material.Unless authorized by a site license, the BITAR may not be transferred to a nonsubscriber or posted on a server or other location that allows access by a non-subscriber. A subscription to the BITAR provides the subscriber with a year-long individual use license or a site license for access by multiple employees at a prices varying with the number of employees given access. The BITAR and its updates may be saved for reading on the subscriber’s individual computer or printed as hard-copy for use by the subscriber. Unauthorized duplication or access to copies is a copyright violation. However, a subscriber may print a single copy and allow others to read it, so long as no other copies are printed by or for nonsubscribers.